Works perfectly with OMSA 6.3 on a PE T110 server. I purchased and installed your Powershell scripts on Server 2008r2. Everything seems to work but no alerts from OpenManaage. I set the temp alert and a warning is being generated. But if I change email 2 to testemail, an email is send to my account. Thanks for the quick response to my issue. We found the problem to be the spam filter on gmail was blocking the test email when the warning message was in the subject line. I remove the spam tag from the emaill address and everything works fine. This works great. Thank you for doing what Dell should have done. To enable reporting to multiple emails, just add another mail to variable to the script IE: $Emailto2 and then add another line to add that variable to the email’s to section. IE: $MailMessage.to.add($EmailTo2). And that’s it, just add as many of those as you like for multiple recipients. Nothing, just leave them empty. the testemail works – from the powershell line – but none of the events I trigger work..
What version of Powershell do you have installed? I have it running on an R310 and it works fine. The version we bought Friday – Nov 18. Hi! I have the same issue as John (OSA 6.5) – works fine from commandline but triggered events dont work – running on Hyper-V R2 with all updates applied. Do you have Powershell V2 installed though? Still no luck with OpenManage triggering the alert script, but if I copy & paste the alert command line from OpenManage onto the server’s command prompt it works fine. and on taskmanager watch the process be spawned when I change the alert threshold so it goes into warning status on the temperature monitor, so it must be in the syntax of the alert commandline. Well done, that is very useful to know! VBScript version will definatley not work on Hyper-V R2 as CDO is not available and it is the primary reason that I wrote the powershell version. Just bought your script, but can’t get it to send even test mail. Changed execution policy to unrestricted, tried different email accounts, but looks like the problem is somewhere else. Can you help me with that? If you can’t get the test to work then you have your mail settings wrong. Simple as that really. Are you using the VBScript version or the powershell? What OS? What mail server? I’m using powershell version. OS – MS server 2008R2x64. Tried different mail servers: gmail, goDaddy hosted company mail. Please advise if I got something wrong. Thanks. This script is fantastic! You could charge double, it’d still be a steal! I use it with my small IT consulting side business. My customers LOVE that I know there’s an issue before they do. “Fehlender Ausdruck nach dem unären Operator “-“. I did not want to put the right syntax into all the configured alarms in the OMSA manually, so I had to change the script a little. The change has to be done in the function "SetDellAlert" as following. I ran the setup again after the change, and now it works smoothly. I hope this helps. Thank you for your script anyway, Paulie! But with a ‘lit’ tempertature probe alert as per instructions, I’m not getting any automated alert? changign the execution policy allowed emails to be sent. Richard – that is interesting. I will check out the bypass option and may change it to be the default. Friedrich – I know that the syntax of the command seems wrong when you see it in OMSA, but when OMSA executes it is ends up being correct. It deals with quotation marks in a very strange way, but does work for most people in the way that the script is written. You can tell by allowing the OMSA process to interact with the desktop. It is the easiest way to troubleshoot it actualy. Great script! I was trying to do something similar as powershell is easy to me, but I could NOT get the right syntax for the damn OpenManage application execution! So basically I bought your script just for that, but it is a nice script so I ended up using it anyway…. I had the same problem. The syntax for the openmanage command within powershell took me ages to get right. Longer than writing the whole script! I had the exact same situation as Richard and changing the execution policy to bypass worked for me as well. Bought the script half hour ago. And now it works! Next time I’ll need maybe 5min with testing. Try changing the powershell execution policy to unrestricted. The PS script is working, but when I test it by opening the server case and setting off the intrusion alert I only get an “alert” email and not an “intrusion” alert email. What do I need to adjust in the script? Thanks in advance! Disregard my last email…I figured it out – I had altered the email subject “ALERTDETAIL”. Great script…thanks for the help!! I would like to embed a link to the OMSA site in the body of the alert email. Can somebody share some insight on how to do this in powershell & also in VBScript? Made a purchase, should I be getting a download link via e-mail or something? scratch that! I figured it out. But the script doesn’t seem to send an alert when you plug a USB drive into the server. It sends an alert for the temperature. But now I am a bit concerned if all the alerts work or not. Any feedback would help. Thanks! Very simple – there is no alert generated when connecting or disconnecting a USB drive, because Dell Openmanage does not generate one for this event. It’s never been an option as far as I am aware, so not sure why you are expecting it. The updated version of openmanage has it as an option. OK, did not know that, I will check it out. The script will need to be changed to reflect the updated option. Thanks! The updated openmanage changes from a blue sidebar to black and has some updated features. OK. I am completed stumped. If I run c:\script\dellal~1.ps1 email 17 from within powershell (32) or (64) it works fine and I get the email. If I run C:\Windows\SysWOW64\WindowsPowerShell\v1.0\powershell.exe -executionpolicy Unrestricted C:\script\DELLAL~1.PS1 email 17 from command prompt the email tries to go out but I see an error on the email server of Socket error sending response to DATA. Winsock error 10054 connection reset from the other side. I do not get it. It works perfect from within powershell but not from command prompt. Got it working fine with VBScript version. Not sure why it will not work with powershell but it does not matter as long as one way works. Are you running that within powershell itself and not a command prompt? It looks like that is a command prompt response. Yep. That is within Powershell allright. Try going to the directory and run dellalerts.ps1 testemail. It should run it as long as it is there. I got it working. I pulled a power supply and received the alert. I did not receive a recovery notification, are those not sent? I a actually two new to the process to answer that question. I do not think so though. Thank you for your kind words, that is probably the nicest comment I have had to date. Powershell is great and well worth taking the time to learn. Personally I still find unix shell scripting easier and more powerful, but that may be because I don’t yet know enough about Powershell. In either case, learning one or the other will help you to understand both, as in my opinion they are very similar. I had to learn almost nothing new to write this script in PowerShell. Purchased the script, got both PS and VB versions working on the respective servers, but is there a way to limit or state how many alerts will be sent out. Our mailboxes got flooded when we had a hard drive failure, great that it works but not so great we received almost 200 emails about the same problem. I have considered adding some code that limits the amount of emails that are sent out. Unfortunatley the script sends a message everytime Openmanage generates the alert, which for some servers seems to be quite a reasonable rate and for others sends many for the same problem. Have you tried updating to the latest version of Openmanage? What version are you running right now? have you updated the script so it detects and sends an alert if a usb drive is plugged in? I have not updated it yet. I will do it this week, it will only take a few minutes. Just been really busy. I will put the latest version of OpenManage on to one of my machines and check out the new options and then post the required code. I am using OM v7.0.0, but I do not get alerts inserting or removing a USB flash drive. Devin, how did you resolve the error? I honestly don’t remember exactly what I did. But I think it had to do with the smtp port and ssl settings in the script. I hope that helps. This script seems to work great, it’s sent me quite a few alerts from different versions of OMSA. The other day I had an email from a server running OMSA 5.5.0 to say a disk had failed, but the server was not displaying an orange warning light. Having looked at OMSA on it and a few of the servers, the ‘alert on console’ is not switched on anymore. Is it possible to have your scipt set this to ‘on’ when it’s run? When I use the ISP's email server to relay (port 25, no security required) it works fine. What am I missing? I have followed the instructions for Gmail as laid out and have tried umpteen variations without success. Anyone have the solutions for this??? Password contained a “$” as the first character. Changed the password not to contain a “$” and it worked! Hope that helps anyone else. i just made it work..awesome. i would like if i can figure this out.. How to configure to have more details in the body of the alert email? like date, time etc? Anyone have a link to the download? Hello, i was wondering if someone could point me in the right direction. I have purchase the download today and have had trouble getting the TESTEMAIL working as suggested. Any other way no email is sent, how do i resolve this? Update : Got this working perfectly on a Windows 2008 r2 datacentre edition server. I couldn’t get the TESTEMAIL working using “Gmail or btinternet settings” not sure if they have changed something to stop this. This isn’t a problem for me as i was never going to use these in the real environment scenario away, I was only using “Gmail/btinternet” to test before implementing real time. On the Windows 2008 server, i created a folder on my system partition called ‘Script’ and place the DellAlert.ps1 in this location. 2. Type “./DellAlert setup” this configures Dell Open Manage Alerts. 3. To test email function either type “./DellAlert testemail” or like I did remove the cover from the server setting off an intrusion alert. Thank you Paulie for your time and effort creating this script, well worth the money. The email alert function is immediate so date/time will be the date and time of the email..
this thing has worked flawlessly up until now on one of my servers. one of the hard drives died and i didnt gt an alert for it. so i ran the testemail and got an email. but when i ran the setup again and tested the script by altering the temp sensor, i get no email. i have no idea whats going on. I tested this on our server by removing the cover and got an alert straight away but been unable to test with harware issue. @neil. ive gotten other alerts for failing hard drives, psu’s etc on other servers. i havent gotten the usb drive insert etc to work yet. im not on site so i cant just pop the side off of this server. getting this error when setting up the script on one of my servers. anyone have any ideas? theres actually more but i have no idea why its no showing the whole message in the post. I have paid for the download and received the link but it seems to be broken. Dell PowerEdge T410 with OMSA v7.0 Works Great! Using the powershell version. Follow the instructions exactly! Worth the $5us that I paid for the script. I paid for the script and then was send an email link to download the file. I have also added my own custom error codes to the script for use with other automated batch file processes that I run on my server for backups etc. Thank you for creating the script Paulie! client was not authenticated. The server response was: 5.5.1 Authentication Required. UPDATE: found the problem. If you have 2 step verification enabled on your gmail account then you need to create and use an application specific password in the script. I have the powershell script able to send the test email from the servers on which I have installed it but it does not get invoked at an alert condition. I lowered the ambient temperature thresholds and OMSA indicated the condition but no email. I have tried the suggestions here such as changing the script to set execution policy to bypass but still NG. I have tested on a PE 2850 and 2950. Hello, will this script work on OPM version 7.10? I just tried your script yesterday and had a couple of questions, not sure if there is a better way to get answers than posting on this page? In order to send the test email I had to use the set-executionpolicy to unrestricted. Since I don’t know much about powershell, is this safe? Is this only for this particular instance of running powershell? 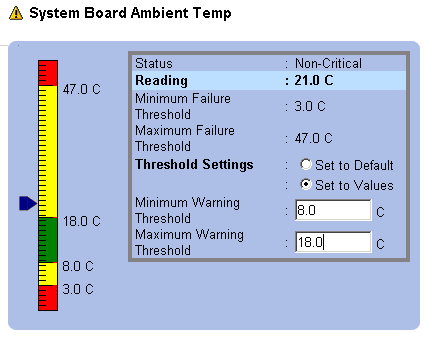 Also, I setup the script and tested an email alert with the temperature monitor and it worked fine. Then, one day later, I unplugged the cord from our secondary power supply and nothing happened, i.e. no email was sent. Should this be working? Or, is this something that is not monitored? Thanks. Love the script. Had absolutely no problems running the PS script in WS2008r2. Well worth the few bucks. Thanks! Great PS script. Just installed on Server 2012 (GUI) and it worked flawlessly. Huge leap over the way you used to have to set up Dell alerts. Excellent work! – Problem was with having “$” in the password – guess this threw off powershell internally. Changed the account password without a $ contained in it and the test email works fine. I did need to set-executionpolicy to unrestricted to test/configure. Thanks for the kind comments everyone. Due to the popularity of this script I am actually working on a new version that will make the procedure easier and procvide more details etc. Very busy at the moment but hope to have it ready by Christmas. New version is written in VB so will not depend on VBScript or Powershell. I bought your script two days ago. Have you finish new VB script or no? I’ve been testing the script on a Dell T620 server, running Windows Server 2012 and Dell Openmanage 7.10. The script was able to send out a test email from powershell with the testemail option, but does not seem to be sending out alerts from openmanage. Any ideas? Could there be a firewall rule issue? It’s amazing that Dell doesn’t include this in Openmanage… Great work! My test emails are working fine, but when I run the Dellalert.ps1 setup command, I’m getting “The term ‘omconfig’ is not recognized…” with no installation successful messages. It seems I have missed a step. Could you help me out? Downloaded and installed the ps-script on a W2K8R2 server. It works great, but there is nothing in the mail body? It seems digging way back in your comments of different set ups, that you mention running your script on a virtual machine in ESX, will not work. It appeared that you mentioned that you would load up a test setup in your empire and see what you could do. Any news on your setup and tests? It would be a huge bonus to have your scripts run with our setup. this script is awesome, i have a small office dell t310 file server, and I have never run a powershell script before, but this was extremely simple to do. I am shocked it was that easy, worth the money. Now I wish there was a way to do this for another server I have that uses intel rapid storage manager, so I can get authenticated smtp alerts for the drives in that server. Well worth the money, thanks for this! WOW!!! WELL worth the few bucks. SO easy and reliable. Thank you!! Where is the download link? I have purchased and paid with paypal but didn’t get the script? Please email your paypal receipt to [email protected] and I will send you the file. Hi, I just paid for the script in hopes the new version will work on Windows Server 2012. I have the old version and the testemail function works and I get the message but when running setup I get the following error– (107, 9) (null): The system cannot find the file specified. I’m hoping the new powershell version works. I didn’t see a download link after paying via paypal, could you please email me the script, the email address hidden in this post if the same as the one I used to pay. Thank you! I’m experiencing the same issue as Mike (first comment). Test email worked fine but the rest was “term unrecognized”. Can you help out here? Just to let you know that this is working very well in my Server 2008 R2 Powershell environment. Question: Can I set the $EmailTo variable to work for > 1 address? e.g. “[email protected], [email protected]” ? Regards, and thanks for this very useful utility. Great script!!!!! Once request I would like to make. Is it possible somehow to flag these email alerts and high priority, so they have a red exclamation mark when they get to the inbox? Sorry, if this has been answered already but I did not see it. If is has, please let me know where I can find the answer. Thanks! Do we get alerts regarding storage like harddrive crash and harddrive removed and inserted of new harddrive. 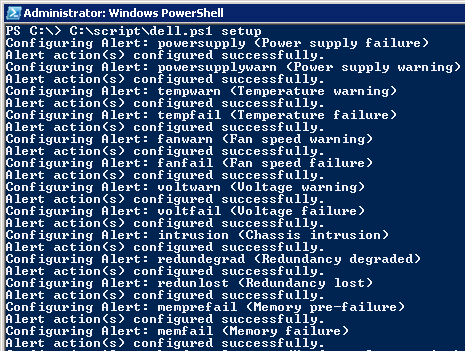 Just curious, how is everyone setting their PowerShell execution policy to get this to run? With the default in Windows Server 2012 set to “restricted” this script won’t work unless you make a change. What is the best way to do it and keep some type of security? Awesome! Worked like a charm on Windows Server 2012 Essentials. question, our google apps system works like gmail but uses our domain name, will this work for us? if so I’ll do a purchase. Well done, glad you figured it out as it saved me the job of translating your error message! No, the email body is supposed to be blank. Although it would be possible to include additional information within it. What sort of thing were you thinking of? Thank you for the follow up, is it possible to include the error info? If a power supply failed, I wouldn’t be as concerned because we run redundant units, but if a HDD failed then I would want to address it with the highest priority (I run all RAID-10 on the MD1220s without a hotspare to maximize storage). It seems, that your powershell script is not working under powershell 4.0. I tryed it with Windows Server Hyper-V 2012 R2 (a Core Edition). Dell Open Manage 7.3 (x64). Maybe you culd help me out. I have not played with Powershell 4.0 yet, but should be able to run a VM and figure out the problem. Thank you for letting me know that it does not work. I have a problem with the script sending multiple emails per alert. I have uninstall old versions on OMSA and reinstall 7.2 and 7.4, but it still sends 9 emails per alert. Any ideas? Other then that the script works great. Hi just purchased and great script, got the powershell script working on a T310 with OMSA 7.4.0 but the email it generates has no body. from powershell on the Server 2012R2 HyperV Core it generates and sends the email with the correct subject but with no body. Thank you for your kind words, glad you found the script useful! You have certainly tested it extensively! Just stumbled on this post as we’re looking for a way to have OMSA send us some email alerts when things aren’t working. Is it still current since it’s from a few years ago? We’d be using it with OMSA 7.4 on mostly Windows 2012 R2. Also, is there a download link somewhere or is it still something I have to buy? You still have to buy it, and it should work fine on Windows 2012 R2. We have paid for your script via paypal. Ah ok, I realized that we should forward the receipt to you. You could just install Dell OME. It does alerting and is another free part of the Open Manage system. Thanks Mike, We can do that however all of these servers/sites are behind a firewall and require port forwarding (i.e. router access) in order to use the Enterprise version and since these are all small customers with 3rd party IT support it would be a nightmare. Copy anyone? Begging… Will offer bribes =o) First born? My wifes cat?? Rights to the neighbors pool (I hear she is pretty hot!) ??? Do you have a mail address you want to publish here? I bought it too, use it all the time. Works still great. I’ve emailed Mason with his download link. Glad script is still working well for you. Sorry for late reply, in the middle of a quite a large implementation. ok a little clarification for the rest of the world not to have to discover by trial and error. The powershell script you modify must remain on the server and in the same location you ran if from. So my advise is to put in in a hidden folder buried deep in the server and run it from there. What the script does is modify the Dell OpenManage to execute this script on event failure (hence the reason you must leave it on the server and this is also how it can survive server reboots, etc..). The drawback is anyone can edit this file when they find it (i.e. open Dell OpenManage and look for file that gets executed on alert) and they can see your email credentials in plain text. $100 to the first person that can create a way to encrypt the password so some other IT guru can’t (using basic hacking skills) work around this and get access to your email credentials. Last think I need is someone sending out email as me to God knows whom….. Using Power Scripts version on new dell T430 w/ OMSA v8.10 64 bit. Chassis intrusion open shows up in OMSA log, but does not send email. Is there a chance that some variable names have changed with v8.1? elling of the name, or if a path was included, verify that the path is correct and try again. .exe -executionpolicy unrestricted C:\Users\pmitchel\Desktop\DELLEM~1\POWERS~1\DELLAL~1.PS1 email 0"
C:\Users\pmitchel\Desktop\dellemail\VBScript\DelAlert.vbs(114,2) (null): The system cannot find the file specified. All helpis appreciated – it's a great script on the Windows 7 boxes! I’m guessing you either don’t have openmanage installed or the path to “omconfig” isn’t your PATH environment variable. I have OpenManage Essentials installed (I should have mentioned that he scripts work with the testemail argument). I don’t have OpenManage Server Administrator installed o nthis server. the testemail argument just tests the email configuration is working. Do you have the “omconfig” executable somewhere on the system? If not is it not going to work. Hmm. On the server where it works, I found omconfig in C:\Program Files\Dell\SysMgt\oma\bin. The oma directory (as well as “omsa” and many others) is not on the Windows 8 box. I’m assuming they’re created by the Server Admin install, which I’ll try next. Good Luck Unix Man – What kind of a UNIX man are you? After purchasing through PayPal, what happens next? I did not see anything to download the scripts from. This tiny app saves your mail password in configuration file as an encrypted string. It is much safer then PowerShell script where mail password is saved in plain text. I’m having issues getting this working. I sent one successful test, then it stopped. Can someone confirm whether these variables look correct? Also, just to mention, I have another app on the same server which emails alerts from the same address to the same receiving address, so I don’t believe it’s an account/server issue, as the other application functions fine. Is the download no longer available? Went to PayPay, paid my $4.00, never got any link to download the software. Will this work on the current version of OMSA (9.2.1)? I used the PS script on a T-110II before this and it worked fine, tried the same script on this one (same email settings) and nothing happens. Would like to get it working on a new deployment.